Nearly two years after bombs exploded at the finish line of the Boston Marathon, killing three and injuring more than 260 others, Dzhokhar Tsarnaev is going on trial in the city, accused of making the bombs with his brother and detonating them in a crowd of spectators cheering on the runners. Tsarnaev, who has pleaded not guilty, faces the death penalty if found guilty of some of the charges. Tsarnaev, 21, is an ethnic Chechen who came to the United States about a decade ago. His family, parents Anzor and Zubeidat, his brother, Tamerlan, and two sisters settled in Cambridge, Massachusetts. He was well liked at Cambridge Rindge and Latin School, where he was captain of the wrestling team and took honors classes, and he was enrolled at the University of Massachusetts Dartmouth. Tamerlan Tsarnaev was killed after the bombings during a shootout with police, after he received gunshot wounds and was apparently run over by his brother. 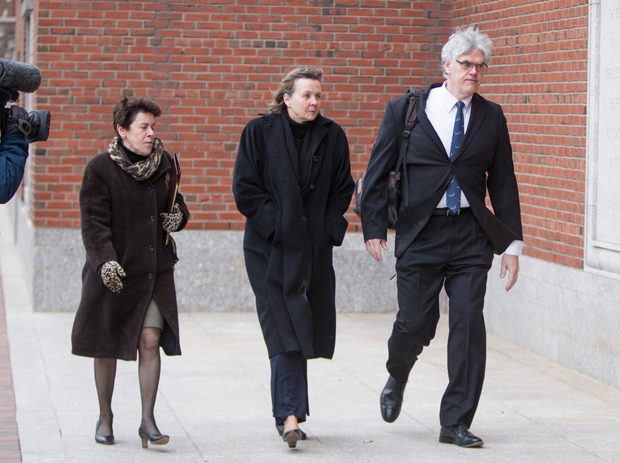 Members of the legal defense team for Boston Marathon bombing suspect Dzhokhar Tsarnaev, (L-R) Miriam Conrad, Judy Clarke and Timothy Watkins walk into the federal courthouse in Boston, Massachusetts in early January. Tsarnaev faces a 30-count indictment that includes 17 charges that carry the death penalty. He is accused of improvising bombs from pressure cookers, explosive power and shrapnel, and detonating them at the finish line of the Boston Marathon. Among the charges: conspiracy to use a weapon of mass destruction resulting in death, possession and use of firearm during and in relation to a crime of violence resulting in death and malicious destruction of property resulting in personal injury and death. A prominent addition to Tsarnaev’s defense lawyer is Judy Clarke, a defense attorney noted for keeping her clients off death row. Her infamous clients have included Ted Kaczynski, known as the Unabomber; Susan Smith, the mother who drowned her two children; Jared Loughner, responsible for killing six people and injuring then-U.S. Rep. Gabby Giffords; and Eric Rudolph, the Olympic Park bomber. All received life sentences. Clark, a staunch opponent of the death penalty, knew at a young age that she wanted to be a lawyer, according to a profile by The Associated Press. She told an audience at Loyola Law School in 2013 that many people charged with capital crimes have suffered severe trauma. "They're looking into the lens of life in prison in a box," she said. "Our job is to provide them with a reason to live." Supporters of Dzhokhar Tsarnaev could be outside the federal courthouse in Boston protesting throughout the trial — over the objections of his lawyers. Tsarnaev’s defense team had argued that he would be unfairly associated with their outrageous conspiracy theories and wanted them kept a reasonable distance away. But U.S. District Judge George A. O’Toole Jr. ruled against them, though he gave no written explanation for his decision. Tsarnaev's supporters include the mother-in-law of Ibragim Todashev, a friend of Tsarnaev’s brother, Tamerlan, who was shot and killed in Florida while being questioned by law enforcement officials. Elena Teyer traveled to Boston in December to shout encouragement to Tsarnaev during one of his court appearances. Some of the protestors insist that the bombings were the result of a government conspiracy, and that Tsarnaev was framed with flimsy evidence. Tsarnaev’s lawyers have tried repeatedly to move the trial out of Boston, arguing that it would be impossible to find an impartial jury in a city so affected by the bombings, but O’Toole has rejected all of their requests. The lawyers appealed to a three-judge panel of the U.S. Court of Appeals for the First Circuit in Boston, but on Feb. 28, a divided panel rejected their petition. The majority wrote that Tsarnaev had not met the well-established standards for the court to intervene. The dissenting judge wrote that the media coverage had been unparalleled in American legal history, making the idea that Tsarnaev would receive a fair and impartial trial absurd.